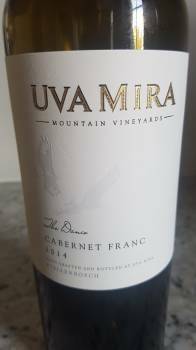 Uva Mira in Stellenbosch is turning out some seriously classy stuff since Christiaan Coetzee took over as winemaker in 2012, The Dance Cabernet Franc 2014 a case in point. Matured for 19 months in French oak, 70% new, the nose shows red fruit, some leafiness and subtle oak-derived notes of vanilla and spice. The attention to detail in terms of both viticulture and winemaking is striking – the wine pure and fresh, medium bodied yet intensely flavoured. It’s very pleasing to drink now but equally should reward maturation. Price: R495 a bottle.